Zoiks! Online - The Very Best in Stand-Up And Music! : An Interview with ‘Cash Cab’ Host Ben Bailey. An Interview with ‘Cash Cab’ Host Ben Bailey. Tweet Ben Bailey is the only cab driver you’d want to ride with. That’s because the host and comedian gives out money to unsuspecting contestants on the hit game show, “Cash Cab.” This Saturday, May 21st, on Comedy Central, Bailey will feature his new special called, “Ben Bailey: Road Rage and Accidental Ornithology.” He recently stopped by to talk about the show, as well as his love for stand-up comedy. Q – Most people know you as host of “Cash Cab.” But you are actually a stand-up comedian. When and why did you decide to become a comedian? A - I moved to Los Angeles when I was 21 to be an actor. I got a job answering phones at The Comedy Store on Sunset Blvd. I was telling a story in the green room one night and ended up with an audience. Then a guy offered me a spot on his show that Friday night. I took the chance and as soon as I got one laugh I knew that stand-up was what I was meant to do. Q – With the success of the show, how much time do you actually have for stand-up comedy? A - I have still made time for stand-up because it's something I need and love. I've been on the road doing clubs and theaters for the last few years every week or every other. 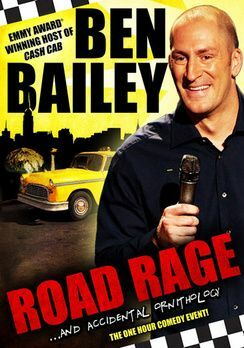 Q – Your first comedy special, “Ben Bailey: Road Rage and Accidental Ornithology,” will debut on Comedy Central on May 21, 2011. When you’re taping a television special, are there specific jokes that make the cut or do you primarily do your club set? A - My first special was actually a few years ago. This is my 2nd. I developed the set for this special in the clubs, so it's pretty much the same set. It is totally clean though, which isn't always true in the clubs. Q – How did “Cash Cab” come into your life? Was this an idea presented to you or did you come up with it? A - I auditioned as part of a nationwide casting call and somehow I ended up with the gig. I almost blew off the audition because it sounded like a really stupid idea. Q – You won an Emmy for Outstanding Host for the show. Who was the most memorable contestant and why were they so memorable? A - It's hard to pick a favorite because there have been so many - 1800 games give or take. Last season I picked up a couple that had just had twins, literally just had them. They won some good money and they said it would really help them with their new kids. So that was pretty memorable. Q – When you’re driving around New York City in the Cash Cab, are you really picking up random contestants or are these people who already know they’re going to be on the show? A - No one knows beforehand that they are getting into the Cash Cab, unless they see me and figure it out, which they often do. Q – What’s the best lesson you’ve learned from when you first set foot on stage?